The Bakehouse Theatre – Main Theatre, Wed 23 May. Frank Forbes is a handyman stuck pretty much alone in his shed working on his various projects. His wife and kids have all left him, but it’s the internet age and Frank finds solace of sorts in his contact with a Nigerian scammer. This eventually changes his life in ways Frank could never have imagined. Written and directed by Matt Hawkins, this is a genuinely funny play. There are some punchy one liners right from the get-go, and it’s hilarious to see how Nigerian scammers see the world of those they’re trying to rip off. Adelaide? Alabama? It’s all the same to them. Stephen Tongun as Ishaku is the perfect scammer: a natural born charmer on the keyboard and just as beguiling in real life. He has a fantastic comic presence and his sense of timing and comic physicality goes a long way towards this show’s success. A super engaging talent. Brendan Cooney does a fine job of playing the sheltered and gullible Frank. Kimberley Fox as Frank’s daughter is loving, independent and playfully critical of her father, while the colourful and feisty Sheila Ablakwa as a slightly dodgy employer-entrepreneur rounds out the strong cast. This is an immensely entertaining production. Occasional references to works of literature, subtle digs at Islam, and jibes about those who conduct their charity works under the banner of clubs like Rotary reveal a more serious and satirical edge beneath the humour. The value of storytelling is central to the play’s purpose. Many scammers are after all just in the game to get money to make movies that tell good stories. And in a self-referential, self-serving meta twist Ishaku is only too aware of the potential of his own life as the source of a great story that should be told! Frank Forbes could have stayed home safe and sound in his shed, but he took a risk and contributed to an infinitely more interesting and funny tale. And it needed to be told. And probably should be a movie. But it might have to wait till another Yahoo boy finds a suitable prey. A great show from the all local SA Playwright’s Theatre. 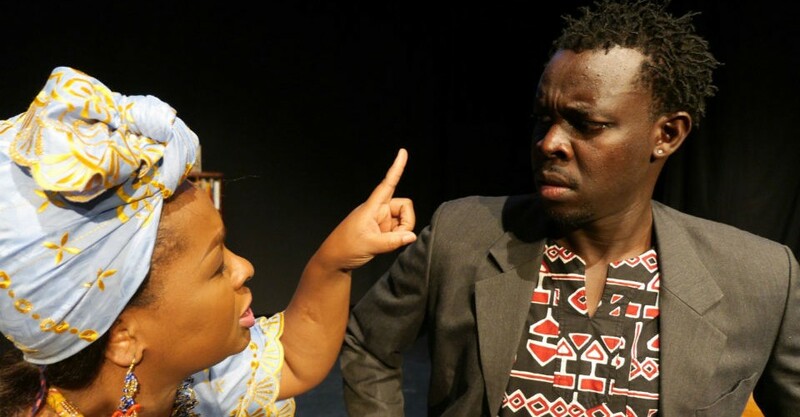 Frank Forbes And The Yahoo Boy continues at The Bakehouse Theatre – Main Theatre from 7.30pm until Sat 18 Jun. Book at bakehousetheatre.com. Click HERE to purchase your tickets. The Bakehouse Theatre - Main Theatre, Wed 23 May. Frank Forbes is a handyman stuck pretty much alone in his shed working on his various projects. His wife and kids have all left him, but it’s the internet age and Frank finds solace of sorts in his contact with a Nigerian scammer. This eventually changes his life in ways Frank could never have imagined. Written and directed by Matt Hawkins, this is a genuinely funny play. There are some punchy one liners right from the get-go, and it’s hilarious to see how Nigerian scammers see the world of those they’re trying to rip off. Adelaide? Alabama? It’s all the same to them. Stephen Tongun as Ishaku is the perfect scammer: a natural born charmer on the keyboard and just as beguiling in real life. He has a fantastic comic presence and his sense of timing and comic physicality goes a long way towards this show’s success. A super engaging talent. Brendan Cooney does a fine job of playing the sheltered and gullible Frank. Kimberley Fox as Frank’s daughter is loving, independent and playfully critical of her father, while the colourful and feisty Sheila Ablakwa as a slightly dodgy employer-entrepreneur rounds out the strong cast. This is an immensely entertaining production. Occasional references to works of literature, subtle digs at Islam, and jibes about those who conduct their charity works under the banner of clubs like Rotary reveal a more serious and satirical edge beneath the humour. The value of storytelling is central to the play’s purpose. Many scammers are after all just in the game to get money to make movies that tell good stories. And in a self-referential, self-serving meta twist Ishaku is only too aware of the potential of his own life as the source of a great story that should be told! Frank Forbes could have stayed home safe and sound in his shed, but he took a risk and contributed to an infinitely more interesting and funny tale. And it needed to be told. And probably should be a movie. But it might have to wait till another Yahoo boy finds a suitable prey. A great show from the all local SA Playwright's Theatre. 4 stars Michael Coghlan Frank Forbes And The Yahoo Boy continues at The Bakehouse Theatre - Main Theatre from 7.30pm until Sat 18 Jun. Book at bakehousetheatre.com. Click HERE to purchase your tickets.